Tuesday is here, woo! Time to kick off day two of Bleach Week with the second film in the series called The Diamond Dust Rebellion. 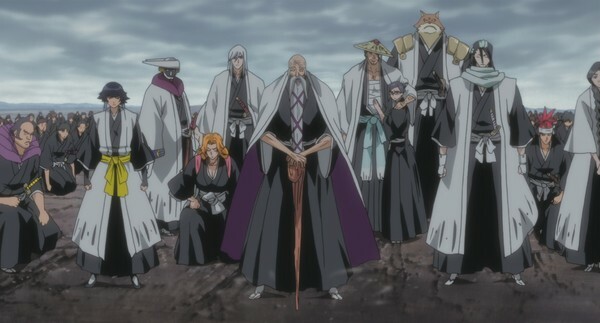 This film is about a group of soul reapers called Squad Ten that are sent on a mission from the Soul Society (the soul reapers main headquarters) to protect royalty that are transporting an ancient artifact to an unknown location. The mission is a failure as a mysterious group of bandits attack them and steal the even more mysterious artifact. Due to this incident the Soul Society aren't very happy and they arrest Squad Ten and charge them with treason as they think they took the artifact themselves. 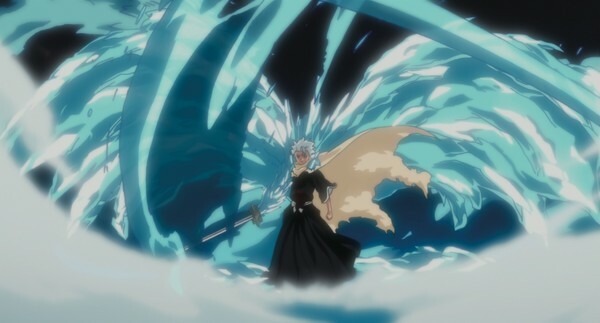 The leader of the group Toshiro Hitsugaya has a strong hunch as to who took the artifact and runs off to find the thief. We then go to Ichigo's house where Ichigo senses something disturbing and he ends up walking into the crime scene where other reapers are investigating. Ichigo gets kicked out and ends up running into a very exhausted Toshiro and takes him back to his house and puts him in his bed. 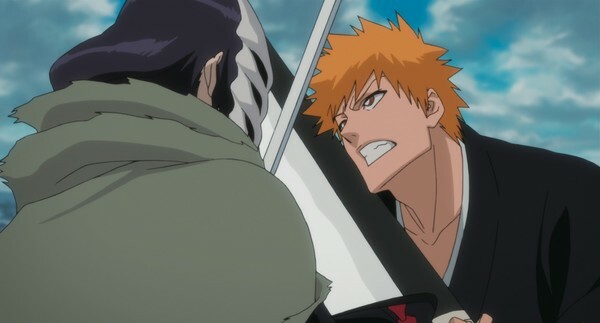 Toshiro wakes up and Ichigo tries to get information out of him to find out what on earth is going on but Toshiro refuses to accept help from anybody and storms off with Ichigo chasing him leading to a battle between the two. Ichigo gets knocked out and his friends find him passed out in the street like a drunken hobo. Meanwhile back at the hall of justice (AKA Soul Society HQ) other reapers are investigating to help clear Toshiro's name and end up finding something interesting that cracks the case wide open. One of them takes off to tell what he found but gets attacked by the guy who took the artifact and we find out that the guy who is doing it is someone from Toshiro's past. The artifact thief and Toshiro eventually meet up with each other and then we see what horrors the artifact can create (not saying what it does cause I don't want to spoil it). (Click "Read More" to see the full article). Unfortunately if you were a fan of the first movie that wasn't familiar with the television series you will be disappointed as this one caters to the fans of the television series so you might have a hard time following what's going on. The story is passable with a good opening but the mystery part of the film is very predictable. The actions scenes were good but they came to the point where they just dragged on for just far too long although some battle scenes do give you a great sense of satisfaction. Characters are pretty enjoyable and you do feel bad for what they go through giving you the spirit to want to cheer them more (even more if you are actually drinking spirits). Animation is really smooth and the artwork is outstanding with some really detailed backgrounds and some very beautiful looking characters with awesome outfits that are well designed. Action scenes also use both (animation and art) very well making it very fun to watch all the attacks that are pulled off. English dub is alright but there are some cringe-worthy lines but honestly the dub isn't the reason why you are watching this film anyway. Just like the first movie the main menu is very sluggish to control making it very frustrating to get through but it's also not as bad as the first film as it's just a bare bones release with no special features so all you have to do is just keep on pressing enter to start the film. Overall this is the weakest film in the series although not terrible but I do recommend renting this one instead of buying it. Good but not great. That concludes day two of Bleach Week with two more films to get through with the next one being titled "Fade to Black" and I have high expectations for it as-well. 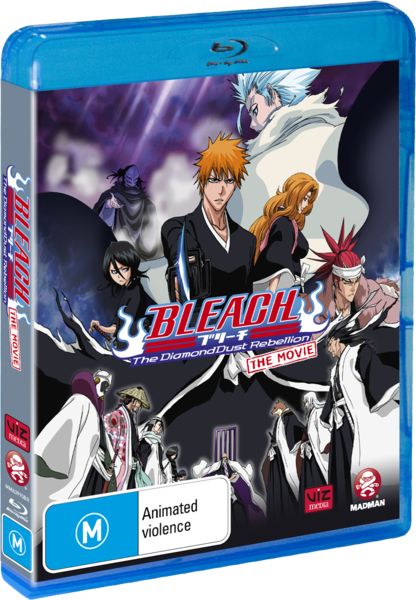 Sadly that review won't be up until Thursday (boo) but there will be a special intermission that has nothing to do with Bleach. What could it be? I know what it is and the clue I will give is that it's the second installment of my quest for hunger (no, it's not me looking for Darabka The Gaming Beast while dressed as a knight). Until then, look up raunchy photos of anime cosplayers on DeviantArt to pass the time (I'm going to get in trouble for that but eh).